At the MACNA 2012 Marine Conference held in Dallas, Texas, Orphek unveiled its new Atlantik Four Channel Programmable LED Pendant which proved to be a huge success with reef aquarists. A testament to this lies in the fact that our first production run of the Atlantik were completely sold out during the few days of its availability. Provide the highest PAR per watt. Provide high Kelvin temperature using a minimal amount of blue LEDs by using our proprietary 17K white LEDs. Provide eight pre-programmed photoperiods for different applications. Provide high PAR for tanks over 36 inches deep. 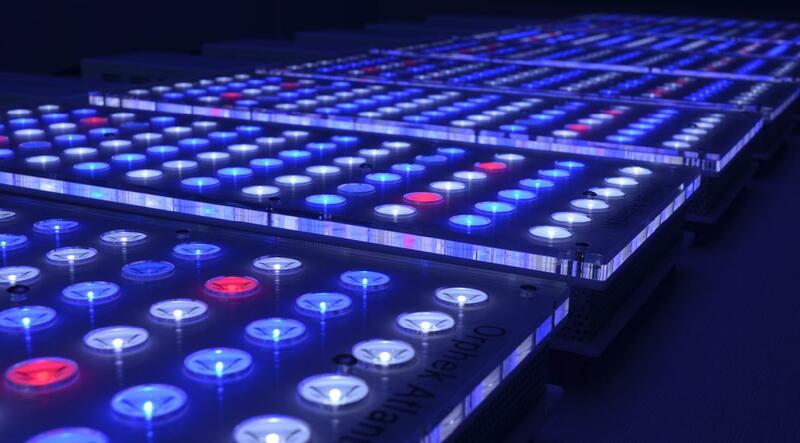 Provide useful features; no gimmickries like storm modes, disco effects, or useless green or yellow LEDs that add cost to the fixture, lower the PUR spectrum and provide no useful benefit to corals. Provide whisper quite cooling fans to eliminate heat thereby extending the life of the electronics. Provide high quality optical lenses so a minimum amount of pendants are needed on large aquariums. Provide high efficiency industrial grade LED drivers. Provide the best PAR/PUR per dollar. Orphek engineers have met or exceeded all the goals that were set and we now have what we feel is the best reef LED pendant available for the price. Our high intensity LEDs were demonstrated with a PAR meter at the recent MACNA conference which resulted in quite a few woos and ahs. A short video can be seen here which demonstrates this. Orphek did not stop with the above goals, the Atlantik also includes eight pre-programmed photoperiods which will allow new users to select a program based on their needs so that they can get their Atlantik up and running while learning how to program their own photoperiod, or they can simply use one of our pre-programmed photoperiods suited to their application. Our Coral Acclimation program is very useful as it allows your corals to adjust to the intensity of the Atlantik without fear of coral recession due to an excessive increase in light intensity. The Atlantik Wide Model provides high PAR/PUR at a height of 47 inches (120cm) and at a distance of 20 inches (50cm) off center for all direction. And at this height and horizontal distance, the Atlantik will still provide a PAR/PUR value sufficient. One Atlantik Wide Model will cover a ~ 48”x 30”x tank with more than enough light intensity for growing SPS corals. At the most distant location from the pendant, the PAR/PUR will still be at least ~70-80 and this is equivalent to about 160 PAR with metal halides while only using 187 watts of power. Compared to metal halide lighting that would be needed for a tank this size (two 175 watt halide lamps), there is a savings of 163watts or 1.63 kilowatt hours per day based on an average 10 hour photoperiod. That’s a savings of 595 kilowatt hours per year. This writer’s energy charges are 79 cents per kilowatt hour which would result in a yearly savings for me of $470.00 dollars, a little more than half the cost of one Atlantik shipped to the USA. Add to this savings are no lamp replacement or chiller expenses. Our new Atlantik four channel programmable LED pendant is sure to please your wallet and your corals. A questionnaire has recently been sent out to owners of our new Atlantik and their responses can be found by following this link. As we receive their responses they will be added so keep checking our site for new entries.